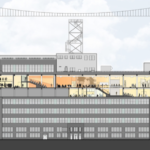 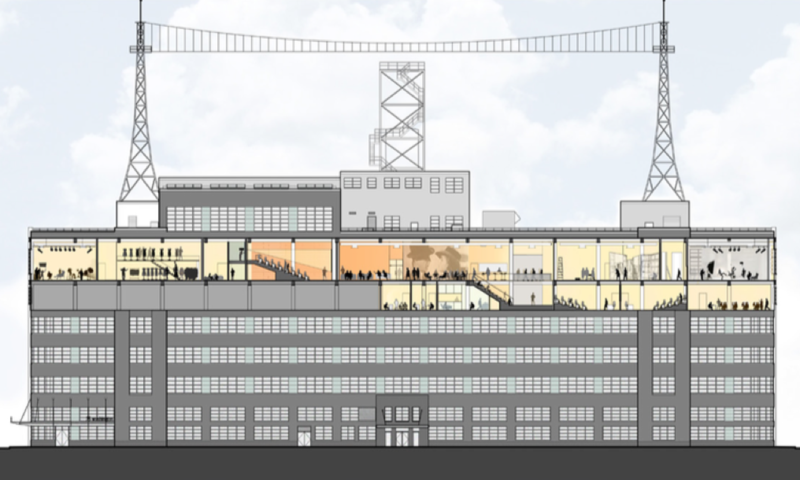 Except for two giant antennae, New York‘s newest film school occupies an unassuming perch atop Steiner Studios in the Brooklyn Navy Yard. 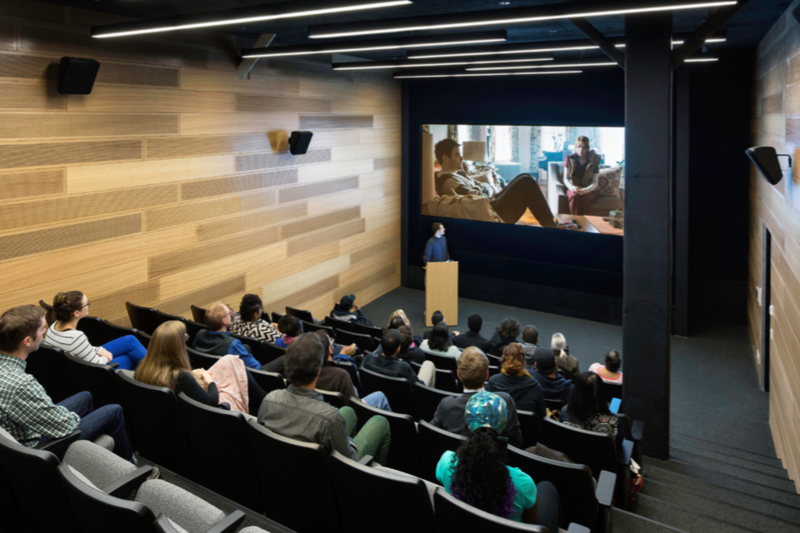 The Brooklyn College Barry R. Feirstein Graduate School of Cinema, a 450-student graduate program, is the first film school at a public college in New York City. 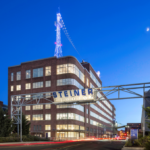 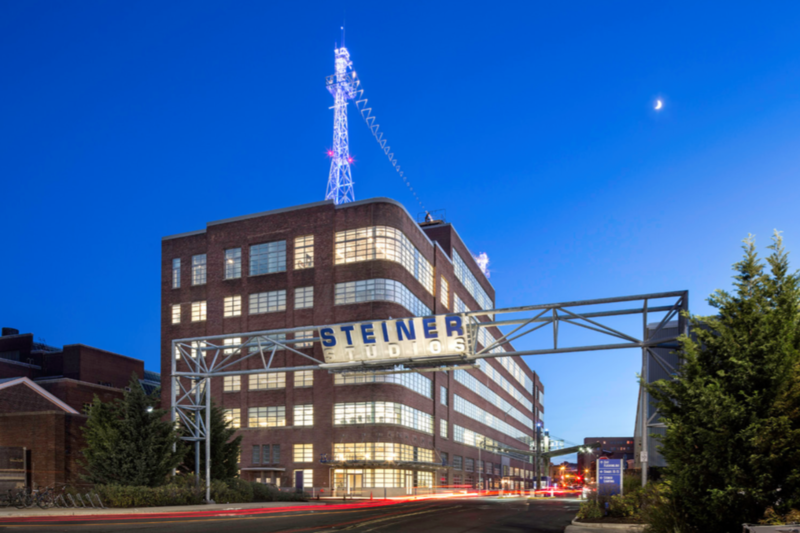 The building is owned by Steiner Studios, a major Navy Yard business with over 18,000 employees. 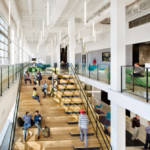 The 300-foot-long-by-100-foot-wide building, which sits on the National Register of Historic Places, used to be a U.S. Navy building. 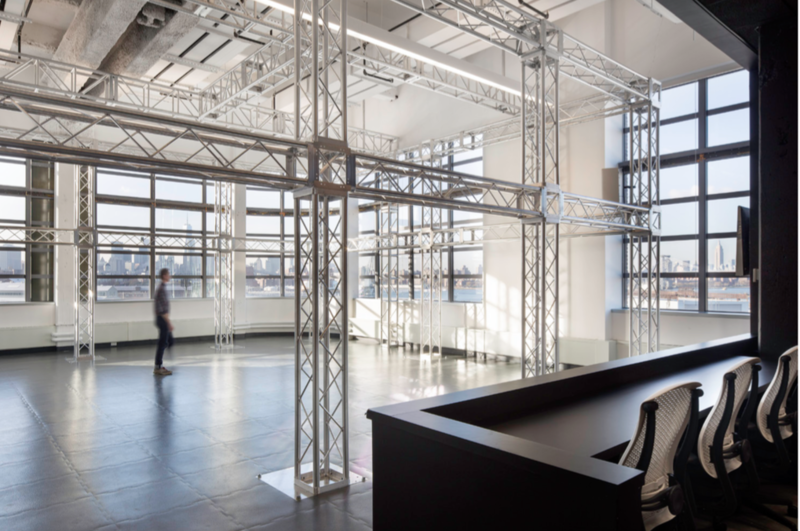 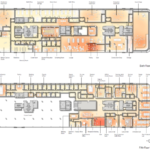 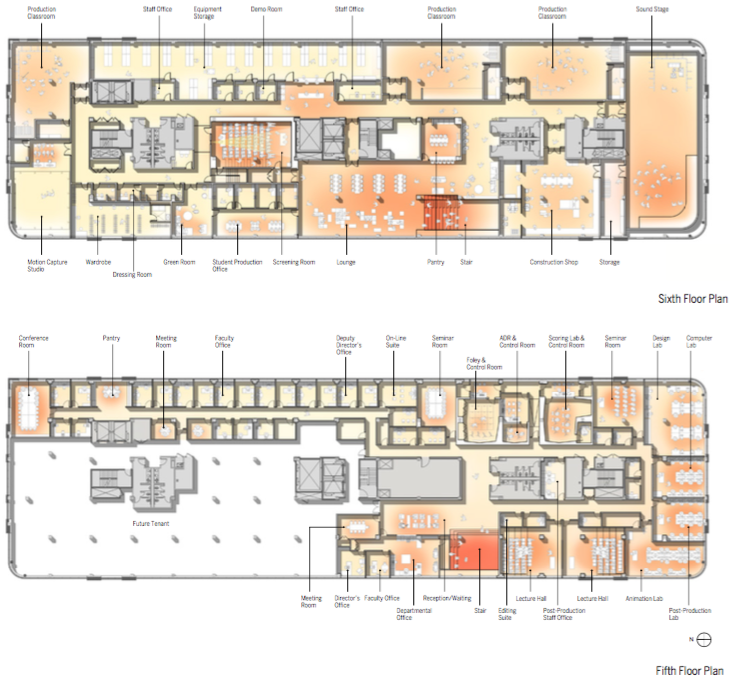 New York–based Dattner Architects renovated the core and shell prior to constructing the film school, design principal Daniel Heuberger explained. 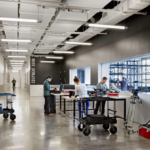 The build-out of the film school, which occupies the fifth and sixth floors, took advantage of the structure’s open spaces created by the industrial-sized spans of its column bays. 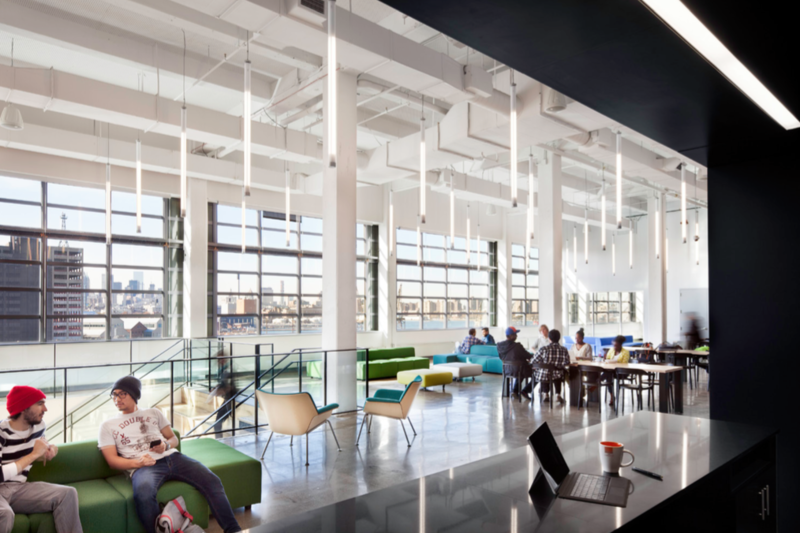 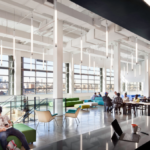 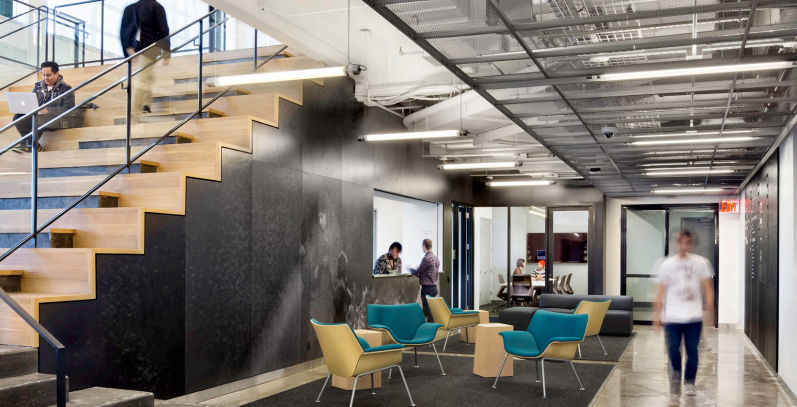 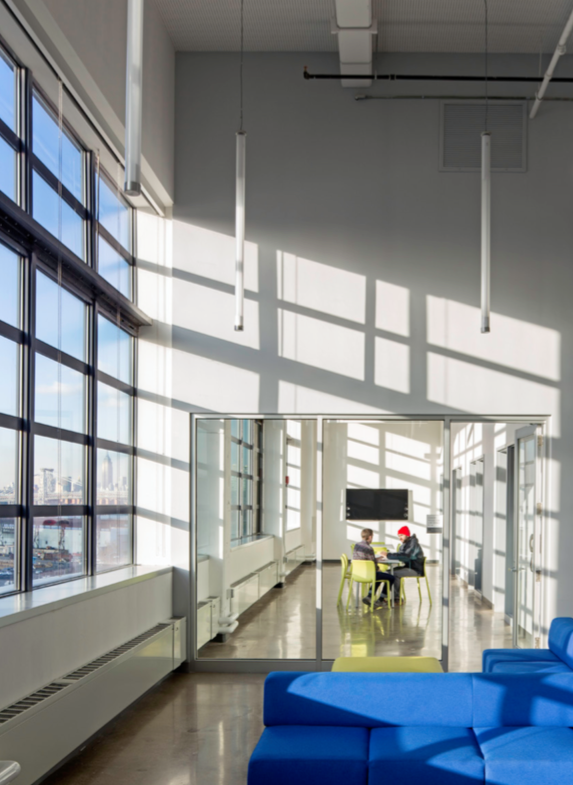 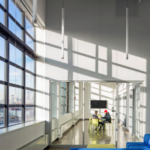 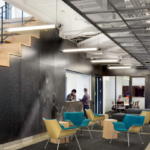 Brooklyn College wanted the space to feel like a “genuine vertical campus,” said Heuberger, with blended academic and social facilities to facilitate interaction among students and industry professionals. 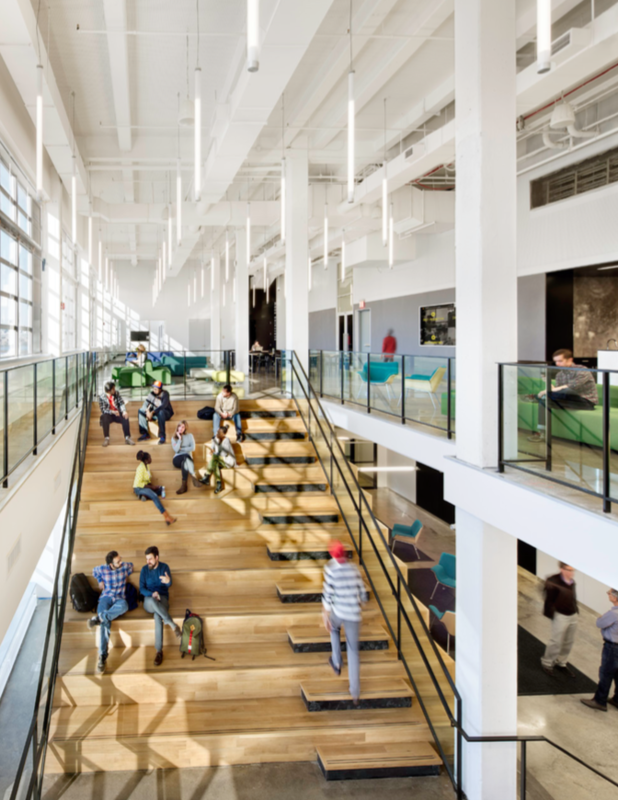 The nucleus of the program is a sixth-floor forum with a study space and cafeteria anchored by a wide-set stairway that can be used for lounging and reading. 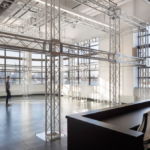 A screening room off of the forum dialogues with production spaces on that floor, while classrooms and offices occupy the floor below. 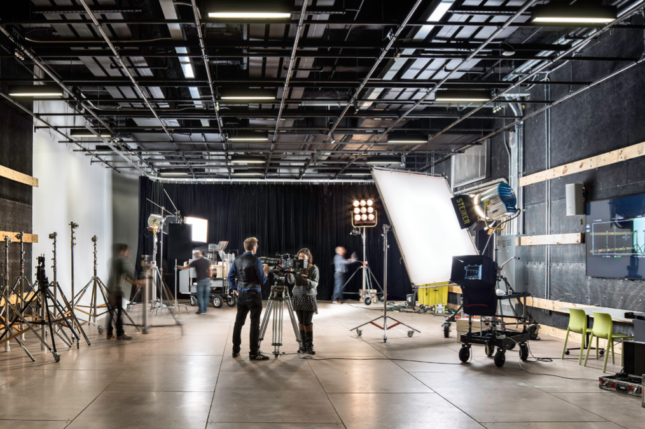 Designing a film school was a big learning curve, and the architects consulted industry experts to insure that a bountiful number of programs could be accommodated. 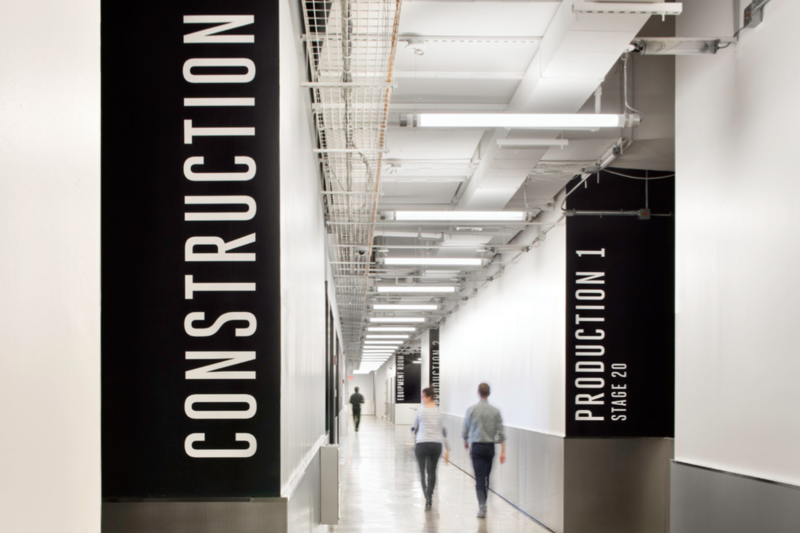 “There’s absolutely no film left in film, it’s all digital. 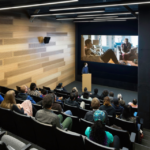 It gives gigantic creative leverage to all students, who before would have had a hard—and costly—time putting together incredibly sophisticated films,” said Heuberger. 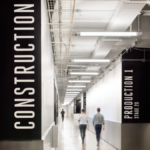 Making a film is a labor-intensive, almost industrial process that requires many people and specialized equipment. 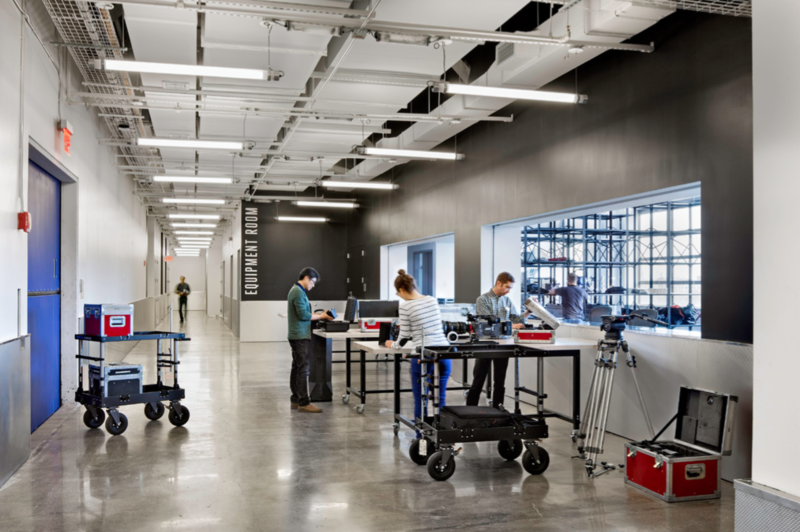 Consequently, the building’s design discourages the auteur model of filmmaking in favor of heavy student-to-student collaboration: A column-free, 120-foot-by-60-foot hybrid production and sound stage facilitates the making process, as does the motion capture studio, equipment room, a construction shop, and foley room. 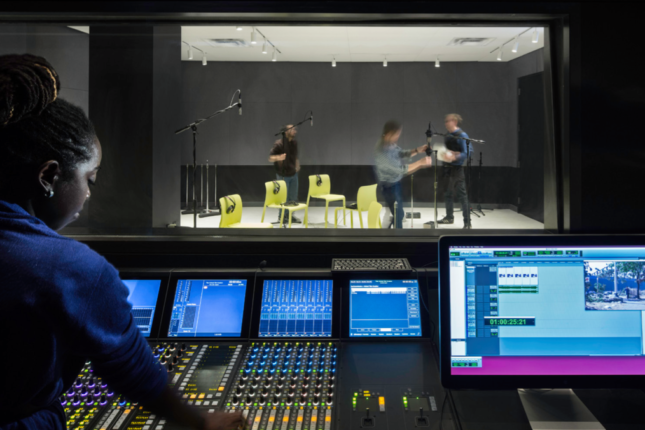 Digital production produces a substantial amount of data, so the school is outfitted with two internal networks—one for email, one for film—to keep projects flowing smoothly.